The Standard Model of particle physics describes the properties and interactions of the constituents of matter. The development of this theory began in the early 1960s, and in 2012 the last piece of the puzzle was solved by the discovery of the Higgs boson at the Large Hadron Collider (LHC) at CERN in Switzerland. Experiments have confirmed time and again the Standard Model's very accurate predictions. Yet, researchers have reasons to believe that physics beyond the Standard Model exists and should be found. For instance, the Standard Model does not explain why matter dominates over antimatter in the universe. It also does not provide clues about the nature of dark matter – the invisible substance that is five times more prevalent than the regular matter we observe. In this Q&A, particle physicist Vera Lüth discusses scientific results that potentially hint at physics beyond the Standard Model. The professor emerita of experimental particle physics at the Department of Energy's SLAC National Accelerator Laboratory is co-author of a review article published today in Nature that summarizes the findings of three experiments: BABAR at SLAC, Belle in Japan and LHCb at CERN. What are the hints of new physics that you describe in your article? The hints originate from studies of an elementary particle, known as the B meson – an unstable particle produced in the collision of powerful particle beams. More precisely, these studies looked at decays of the B meson that involve leptons – electrically charged elementary particles and their associated neutrinos. There are three charged leptons: the electron, a critical component of atoms discovered in 1897; the muon, first observed in cosmic rays in 1937; and the much heavier tau, discovered at the SPEAR electron-positron (e+e-) storage ring at SLAC in 1975 by Martin Perl. Due to their very different masses, the three leptons also have very different lifetimes. The electron is stable, whereas the muon and tau decay in a matter of microseconds and a fraction of a picosecond, respectively. A fundamental assumption of the Standard Model is that the interactions of the three charged leptons are the same if their different masses and lifetimes are taken into account. Over many years, different experiments have tested this assumption – referred to as "lepton universality" – and to date no definite violation of this rule has been observed. We now have indications that the rates for B meson decays involving tau leptons are larger than expected compared to the measured rates of decays involving electrons or muons, taking into account the differences in mass. This observation would violate lepton universality, a fundamental assumption of the Standard Model. What does a violation of the Standard Model actually mean? It means that there is evidence for phenomena that we cannot explain in the context of the Standard Model. If such a phenomenon is firmly established, the Standard Model needs to be extended – by introducing new fundamental particles and also new interactions related to these particles. In recent years, searches for fundamentally new phenomena have relied on high-precision measurements to detect deviations from Standard Model predictions or on searches for new particles or interactions with properties that differ from known ones. What exactly are the BABAR, Belle and LHCb experiments? They are three experiments that have challenged lepton universality. Belle and BABAR were two experiments specifically designed to study B mesons with unprecedented precision – particles that are five times heavier than the proton and contain a bottom or b quark. These studies were performed at e+e- storage rings that are commonly referred to as B factories and operate at colliding-beam energies just high enough to produce a pair of B mesons, and no other particle. BABAR operated at SLAC's PEP-II from 1999 to 2008, Belle at KEKB in Japan from 1999 to 2010. The great advantage of these experiments is that the B mesons are produced pairwise, each decaying into lighter particles – on average five charged particles and a similar number of photons. 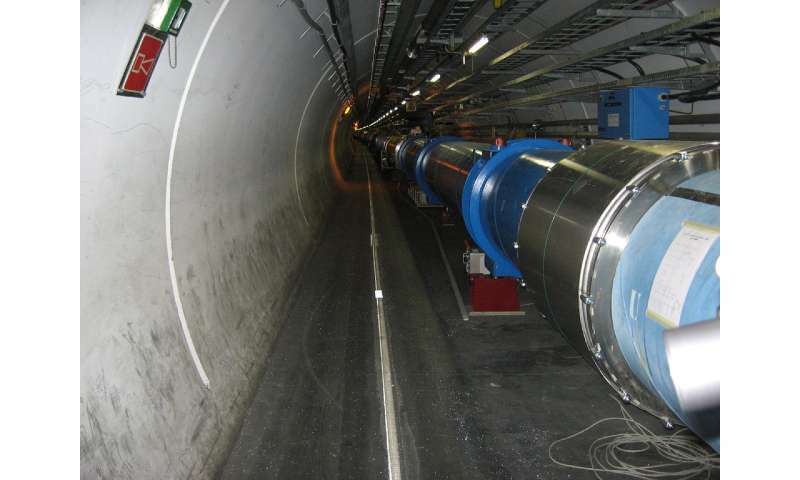 The LHCb experiment is continuing to operate at the proton-proton collider LHC with energies that exceed the ones of B factories by more than a factor of 1,000. At this higher energy, B mesons are produced at a much larger rate than at B factories. However, at each crossing of the beams, hundreds of other particles are produced in addition to B mesons. This feature tremendously complicates the identification of B meson decays. To study lepton universality, all three experiments focus on B decays involving a charged lepton and an associated neutrino. A neutrino doesn't leave a trace in the detector, but its presence is detected as missing energy and momentum in an individual B decay. What evidence do you have so far for a potential violation of lepton universality? All three experiments have identified specific B meson decays and have compared the rates of decays involving an electron or muon to those involving the higher mass tau lepton. All three experiments observe higher-than-expected decay rates for the decays with a tau. The average value of the reported results, taking into account the statistical and systematic uncertainties, exceeds the Standard Model expectation by four standard deviations. This enhancement is intriguing, but not considered sufficient to unambiguously establish a violation of lepton universality. To claim a discovery, particle physicists generally demand a significance of at least five standard deviations. However, the fact that this enhancement was detected by three experiments, operating in very different environments, deserves attention. Nevertheless, more data will be needed, and are expected in the not too distant future. What was your role in this research? As the technical coordinator of the BABAR collaboration during the construction of the detector, I was the liaison between the physicists and the engineering teams, supported by the BABAR project management team at SLAC. With more than 500 BABAR members from 11 countries, this was a challenging task, but with the combined expertise and dedication of the collaboration the detector was completed and ready to take data in four years. Once data became available, I rejoined SLAC's Research Group C and took over its leadership from Jonathan Dorfan. As convener of the physics working group on B decays involving leptons, I coordinated various analyses by scientists from different external groups, among them SLAC postdocs and graduate students, and helped to develop the analysis tools needed for precision measurements. Almost 10 years ago, we started updating an earlier analysis performed under the leadership of Jeff Richman of the University of California, Santa Barbara on B decays involving tau leptons and extended it to the complete BABAR data set. This resulted in the surprisingly large decay rate. The analysis was the topic of the PhD thesis of my last graduate student, Manuel Franco Sevilla, who over the course of four years made a number of absolutely critical contributions that significantly improved the precision of this measurement, and thereby enhanced its significance. What keeps you excited about particle physics? Over the past 50 years that I have been working in particle physics, I have witnessed enormous progress in theory and experiments leading to our current understanding of matter's constituents and their interactions at the most fundamental level. But there are still many unanswered questions, from very basic ones like "Why do particles have certain masses and not others?" to questions about the grand scale of things, such as "What is the origin of the universe, and is there more than one?" Lepton universality is one of the Standard Model's fundamental assumptions. If it were violated, unexpected new physics processes must exist. This would be a major breakthrough – even more surprising than the discovery of the Higgs boson, which was predicted to exist many decades ago. What results do you expect in the near future? There is actually a lot going on in the field. LHCb researchers are collecting more data and will try to find out if the lepton universality is indeed violated. My guess is that we should know the answer by the end of this year. A confirmation will be a great event and will undoubtedly trigger intense experimental and theoretical research. At present we do not understand the origin of the observed enhancement. We first assumed that it could be related to a charged partner of the Higgs boson. Although the observed features did not match the expectations, an extension of the Higgs model could do so. Another possible explanation that can neither be confirmed nor excluded is the presence of so-called lepto-quarks. These open questions will remain a very exciting topic that need to be addressed by experiments and theoretical work. Recently, LHCb scientists have reported an interesting result indicating that certain B meson decays more often include an electron pair than a muon pair. However, the significance of this new finding is only about 2.6 standard deviations, so it's too early to draw any conclusions. BABAR and Belle have not confirmed this observation. At the next-generation B factory, Super-KEKB in Japan, the new Belle II experiment is scheduled to begin its planned 10-year research program in 2018. The expected very large new data sets will open up many opportunities for searches for these and other indications of physics beyond the Standard Model. Confirm the standard model time and time again or not, there have been so many experiments that show the standard model is wrong over and over again and the result is already so old that a Nobel Prize has already been awarded for doing the experiments that prove unambiguously that the standard model is wrong. This was the Nobel Prize in 2015. If the standard model was correct neutrino would have no mass but they do. Where do you come up with these articles? "Oh I'll just write whatever, people who come to this website won't know any better." Confirm the standard model time and time again or not, there have been so many experiments that show the standard model is wrong over and over again and the result is already so old that a Nobel Prize has already been awarded for doing the experiments that prove unambiguously that the standard model is wrong. I found the comment at he end by the interviewee to be a bit funny. Says " great progress but some things remain to be resolved" then lists stuff like the origin of the universe. Jesus.....as if that was a minor detail. The Standard Model is a walk in the park next to that one. What ever theory answers that does not even belong in the same ball park as the Standard Model. and certainly not at CERN. the experiments there are like child's play next to what you need to figure out the origin of the universe and identifying the "whole" universe. Now days they break it up into more than one. ..which is absurd. So what do you call all of all the multiverses ? your gonna need a new name since you used up the word universe.
" the Standard Model does not explain why matter dominates over antimatter in the universe." "It also does not provide clues about the nature of dark matter – the invisible substance that is five times more prevalent than the regular matter we observe." No rush here either. For example in the filaments between galaxies - areas of spacetime stretched by the pull of gravity. Likely a problem in understanding what gravity really is. For example in the filaments between galaxies - areas of spacetime stretched by the pull of gravity. Likely a problem in understanding what gravity really is. Or does gravity really exist at all? If you were in a box with no means of communicating with anything outside, how would you know whether you were on the surface of Earth or in a spaceship accelerating at about 10 metres per second per second? There is NO DIFFERENCE between gravity and acceleration. You have to wonder why Newton invented gravity at all, but I suppose it fitted scientific knowledge at the time. Problem is, nowadays it needs Dark Matter, Dark Energy, gravitons, gravity waves, etc. to explain how it can work, none of which have been found despite numerous experiments. (They didn't detect gravity waves, they detected time distortions). Problem is, nowadays it needs Dark Matter, Dark Energy, gravitons, gravity waves, etc. to explain how it can work, none of which have been found despite numerous experiments. (They didn't detect gravity waves, they detected time distortions). So try something found in numerous experiments like the expansion of spacetime. It works for me anyway. Actually the expansion explains Newtonian gravity. GR includes this expansion and other properties of spacetime. We offer a research project entitled "Deuteron project" to anyone with pejudiceless scientific concerns, with the experimental means and the desire to carry it out. We address it in particular to nuclear physics laboratories as well as to particle acceleration centers. It is intended to deepen the structure of the atomic nucleus, in the present case of the deuteron, through three specific experiments, which can be carried out independently. The analysis will be enriched by comparing their different results.